Two young men from Princeton, Minn.
Four photos (snapshots and a studio portrait) measuring, clockwise from top left: 4.5 x 2.75 inches (with mounting traces around the edges), 4 x 6 inches, 2.75 x 4.5 inches, 4.25 x 6.25 inches. On the back of the bottom left photo is written Andrea Patterson – 18 mos. Otherwise undated and unidentified. I’m still getting used to sizing things when I scan and download them so that you can clearly see detail without overwhelming the post. For some reason the preview function doesn’t work on my blog, so we’ll see how this turns out. I didn’t think most of these photos warranted their own individual posts, but they seemed to make an interesting grouping. I’ve certainly seen different styles of bicycles from different eras, but I didn’t realize tricycle styles changed, too. I guess I just hadn’t thought about it. 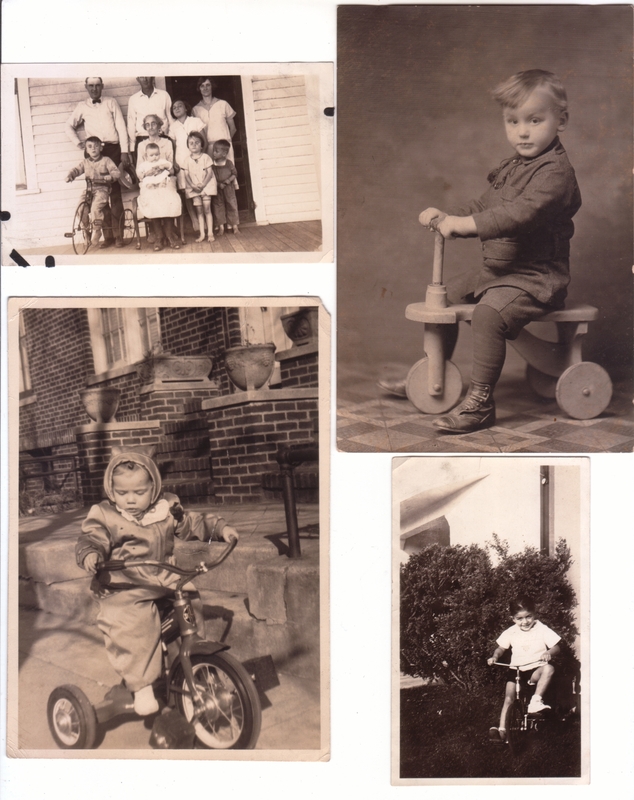 The one in the upper left has a wonderful old look that I’ve never seen before in a tricycle. I wonder if the one in the upper right is a prop or the little boy’s toy – I can imagine it as either.